My sweet husband help me set up and put all the food together, since I’m moving a little slower these days. Didn’t he do a great job?!? 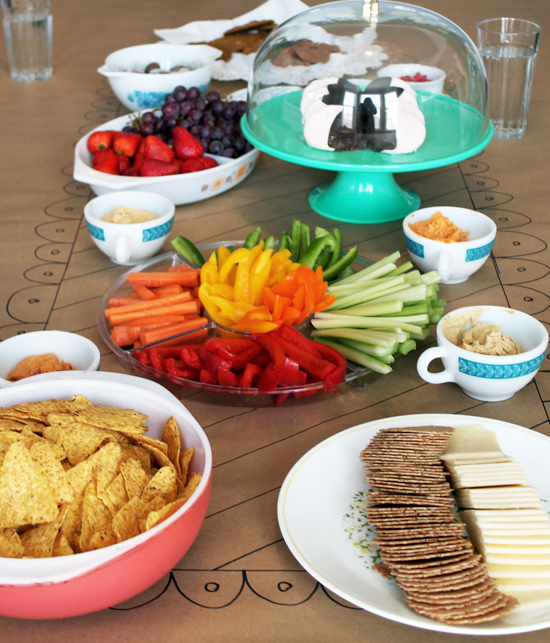 All simple snacks that don’t require a plate. One guest just used the table (I won’t name names) which was exactly why I used Kraft paper, instead of a real tablecloth. Messes were welcome! I had been trying to figure out something super simple we could do while hanging out, and I seriously could not think of a thing for TWO MONTHS! Then, of course, I had an idea the night before. I quickly stitched up a few knit hats that we could embellish with beads and plastic flowers from my craft stash. It was super easy and all the hats ended up really cute! My sister Cori (who a few of you have possibly met if you’ve ever seen me at a craft show) has been experimenting with making Blythe clothes and accessories lately. I just had to share this adorable dress and skirt she made!! How cute are they? She’ll be attending BlytheCon with me in August, and I’m urging her to bring a bunch of these! You guys also get the privilege of seeing the aftermath! This was me thinking “oh no, I forgot to take photos today!! !” and quickly snapping this before putting everything away. I had a lot of fun and am so glad to see the girls who came!! Maybe I’ll host one again? I’m also super excited about the fact that my house is pretty clean and kinda tidy right now. 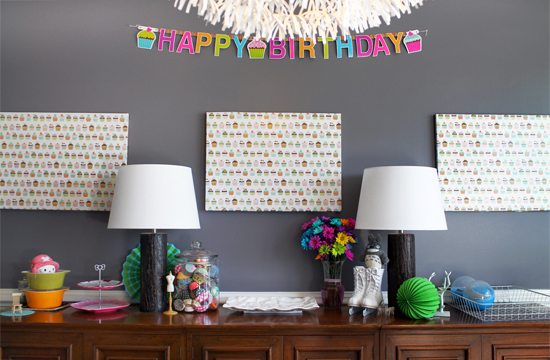 Having parties is a great way to keep your house presentable. Ha, my husband says it’s one of the reasons he’s cool with having so many. As I said yesterday, I wanted to share a bit more about the decorating and goody bags from CT’s 3rd Birthday Party. 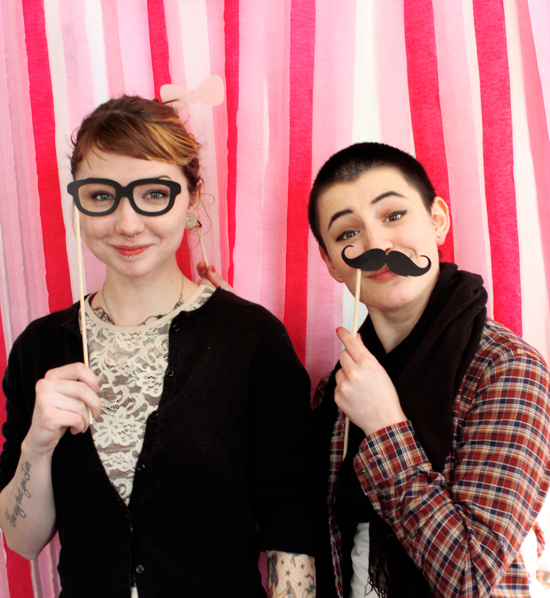 I was very frazzled the day of, so all these photos were taken the day after! Just imagine cupcakes sitting on the white tray in the middle, some macarons on the two tiered tray and more “goody bags” in that white basket. Plus other odds and ends that were moved about. It was a lot of fun to pick everything out, be it handmade, from a store or just from around the house. I didn’t go overboard, and I think it looked very cute and sweet. I really wish I had taken photos the day of!!! I accidentally stumbled onto a color theme. 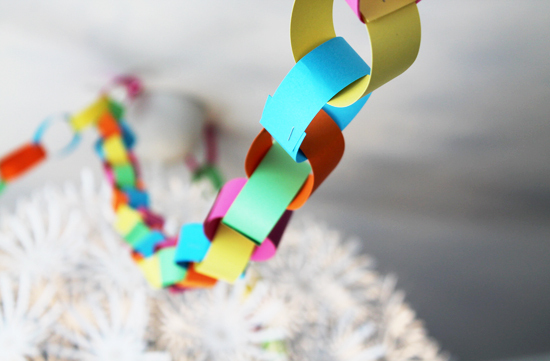 It all started with those paper chains, I just picked out a multi pack of paper in what I thought were cute colors. After making them all (at night and in the car btw) I started to buy other things in the same colorways. All of the plastic silverware was in those colors, the last minute “Happy Birthday” banner matched (I meant to make one), even the flowers I found the night before matched! I sorta, kinda, accidentally made it all match! Ha. I love when things work out that way. Oh and the wrapped picture frames! A lot of the guest liked those. I mainly did it because I felt the photos artwork underneath wasn’t really appropriate for a kid’s birthday party. It’s my Jordan Crane Triptych of a party with loads of booze on the ground, you can see it here. It’s fine for everyday viewing, just not a birthday. I love the way it all looks, and I really don’t want to take it all down. Do I have to? These were a last minute idea! I mean, four days before the party last minute. I was flipping through the Fabric-by-Fabric One-Yard Wonders book to see if there were any xmas gifts I could make, when I came across the pattern for a kid’s adjustable chefs hat and apron. I read through the instructions and figured they wouldn’t be too hard to make, so I made a test one. The one above actually. It took me about 25 minutes from start to finish (I’ve been told I sew FAST, so it make take others longer). I figured 11 kids were coming, and that they would only take me an afternoon to make one for each. It kinda did. I ran out of some supplies halfway through and had to wait until I could go out and get them. Then I waited until the night before to attach the velcro, which wasn’t the best idea. But I’m glad I made them! 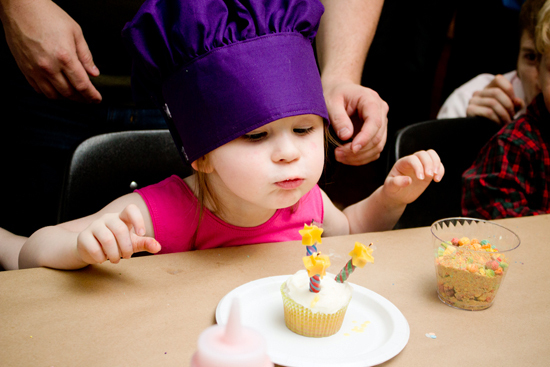 All the kids looked soooo cute decorating their cupcakes while wearing chef hats!! Now onto the goody bags, or in our case, balls! My original plan was to make the bags for the goody bags, but after seeing the over sized gumball machine capsules above, I changed my mind! How cool are they? We bought them in blue, green and purple. CT picked out a kazoo, mini view-master camera thingy, some chocolate and tattoos/stickers. I didn’t want to only have plastic trinkets in the balls though, so like an insane woman, I also made the crayon rolls! Another last minute idea. I felt crazy making them, so I didn’t even tell my husband what I was doing until I was halfway through. I didn’t want someone else thinking I was crazy too! They actually took less time then I thought they would and I was able to just use scrap fabric from my stash. In the end it was all more work than I anticipated, but you know what? I felt great about the way the house looked and the things I sent home with each kid! Now they each have a chef hat for pretend play, and a crayon roll to take with them anywhere. Plus I made one of each for CT too. I wouldn’t change a thing, well, with the exception of having more sewing machine needles on hand. I know there’s loads of tutorials online to make crayon rolls, I didn’t use any of them because of their sizes. Would anyone be interested in a tutorial to make these simple ones? This past weekend was CT’s 3rd Birthday! Finally. I feel like I’ve been planning and making for this party for way too long. This is really the first year she’s aware of everything going on around her, so I wanted to make the day awesome!. We invited a bunch of our friends and family, and ended up having ten kids show up total!! Only one couldn’t make it, not bad right? Especially for a winter birthday party, where you assume someone (or everyone) would be sick. 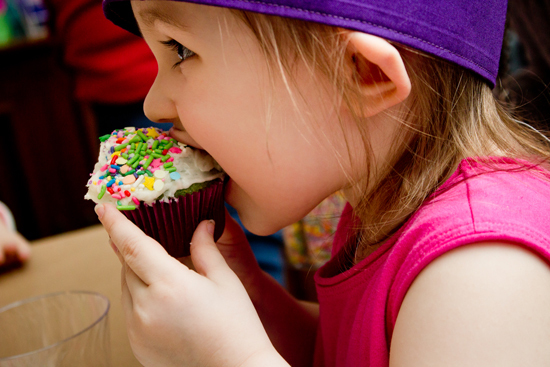 My original plan was to let the kids ice the cupcakes themselves and then decorate them with any of the numerous toppings we had. As the party grew closer I realized a lot of the kids that would be attending were younger than CT, so the icing part might just be a huge mess. So we iced the cupcake beforehand, that way all they had to worry about were the toppings. I have been collecting sprinkles and cupcake liners for awhile, with no real purpose, until this party! I was able to provide 25 different types of toppings. There were colored sugars, candies in the shape of mickey and the aliens from Toy Story, dinosaur and snowflake sprinkles, long sprinkles, metallic sprinkles, two different types of cereal and more. I made sure to have every color of the rainbow, so each kid could use their favorite. I also made a small batch of cotton candy buttercream in pink and blue, and small squeeze bottles with them. 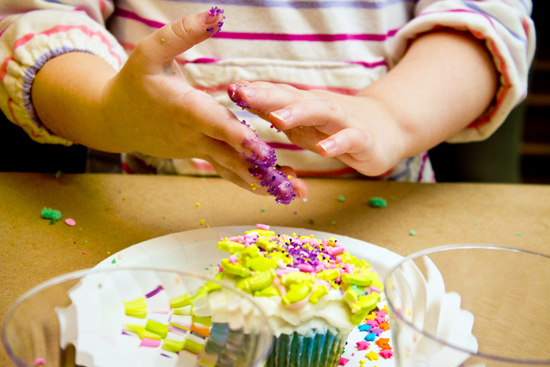 That way the older kids could draw on their cupcakes if they wanted. It was really fun watching the kids all sit down nicely, put their chef hats on (I’ll talk about those in another post) and then go crazy decorating. A few of the younger ones couldn’t wait to decorate and just ate the cupcakes right away, but I made a bunch so they decorated their second one. A lot of the adults were convinced our dining room would be a disaster afterwards. They were so wrong, most of the mess stayed on the table (which I covered in kraft paper) and hardly anything hit the ground. We had a very careful bunch of kids!! Seriously parents, your kids are all so nice!! After all the decorating everyone was encouraged to eat from the buffet (that our families helped cook), let their little ones burn off some of the sugar they ingested, and then settle down before CT started opening gifts. There are loads of great photos of her opening her gifts, she really makes the best faces!! I just figured 13 photos was already too many for one post, even if it IS a birthday post! Oh and while I’m kinda on the topic about photos, how awesome are these? My little sister Ashley took them for me, that way I didn’t miss anything. She also edited them before sending them over, super awesome of her! Thanks Ash! The party went way better than I expected, and I’m beyond grateful for everyone who came. Thank you to you all, you really made CT’s birthday extra special!! Also thank you to all of our family members who helped out, I really couldn’t have made it through this day without you guys. It was all a lot of fun, and I wouldn’t change a thing. CT loved it all and keeps talking about it. We did all catch a cold, but it was totally worth it! 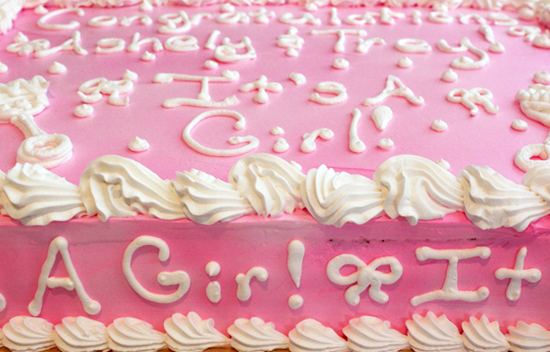 I still have a two more posts coming up about the decorating, goody bags and sweets, so keep an eye out!